Hey Lovelies! Welcome to all you blog hoppers and hi again to all the B. Lovely readers! 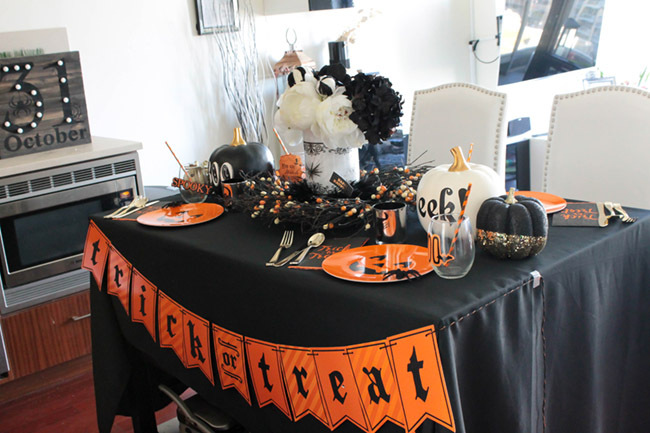 You are at the end of a fabulous week of a Halloween Tablescape Blog Hop hosted by the very talented Chloe at Celebrate and Decorate that we are so thrilled to be a part of. There is lots of spooky, lovely fun to be had! 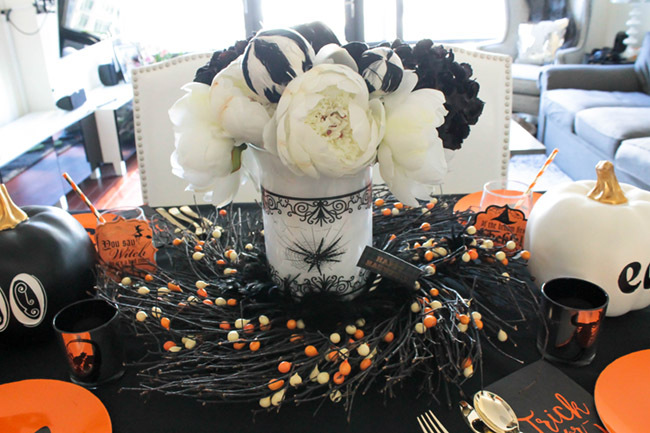 Below is our take on a sophisticated yet fun Halloween tablescape. 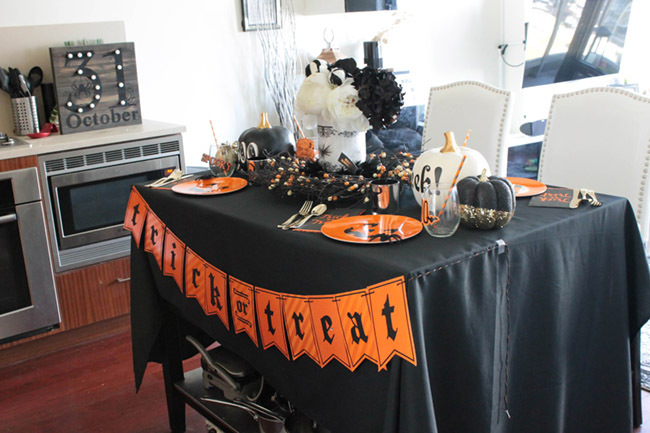 Be sure to check out all of the other Halloween tablescapes on the schedule posted below. 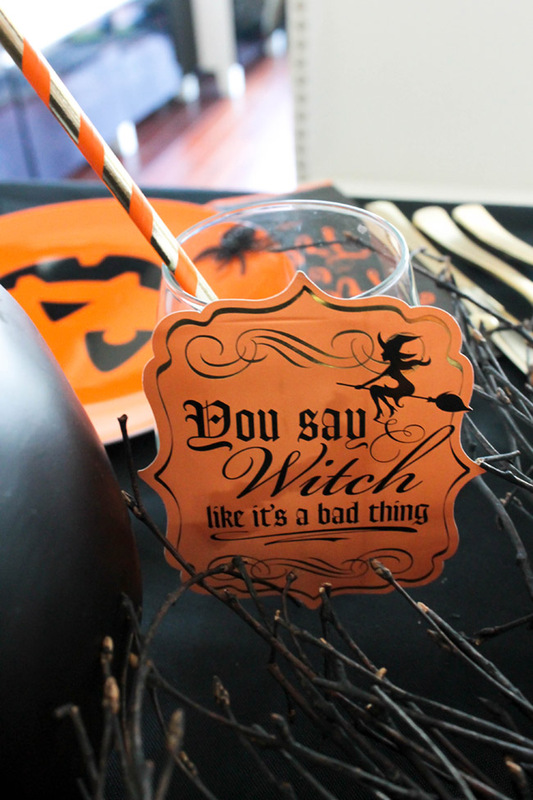 They are filled with tons of eye candy and lots of inspiration for your Halloween parties. We did a mix our our favorite color palette, black and white, and mixed in the classic orange to really make the Halloween theme pop! To make it a little more chic, we added gold. Gold goes with everything! Including Halloween. We just love how all of the colors blended and played off each other so well here! We found this seriously lovely Boo pumpkin at Jo-Ann Fabric & Craft Stores. How cute is this They seriously have some of the cutest Halloween decorations and right now they are 60% off! 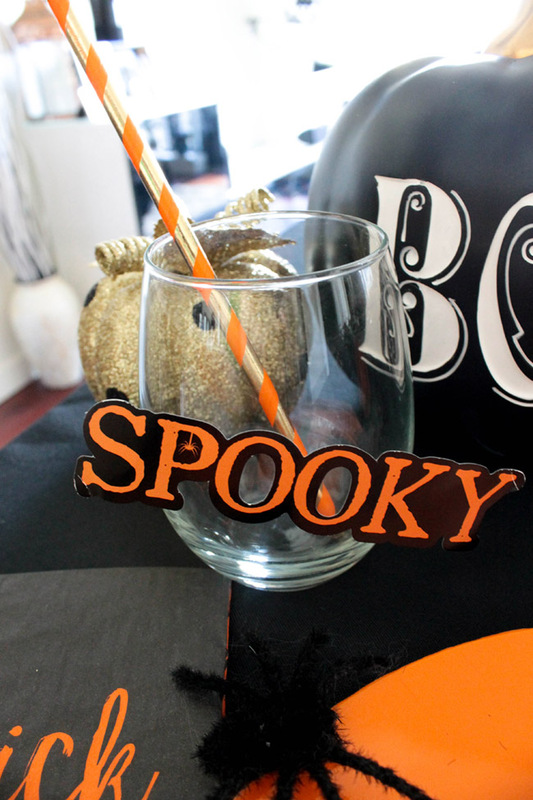 We decorated each stemless glass with a fun Halloween sticker to really give it some character!The added orange and gold straw added a little pizzazz to the glass too. Can’t wait to take a sip out of this glass! 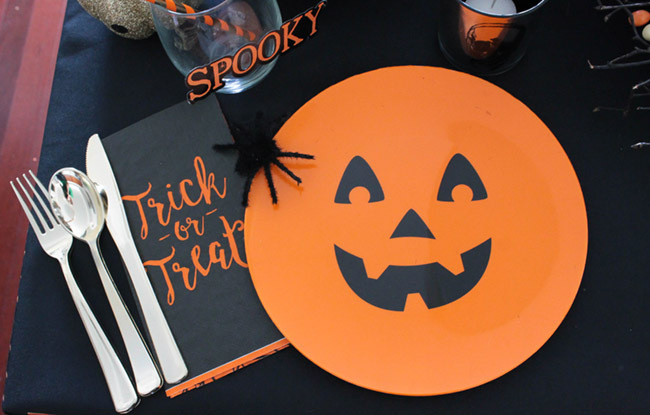 How fun are these pumpkin face plates? We love them! Found them at the checkout bins at Jo-Ann for a steal! 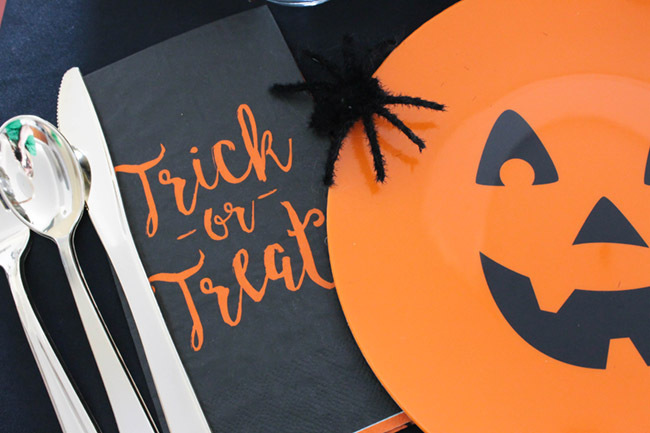 With this Halloween place setting we really tried to mix the sophistication and fun with gold silverware, and fun trick or treat napkins. The added spider was to bring a little spooky in too! We are in love with this Halloween centerpiece! 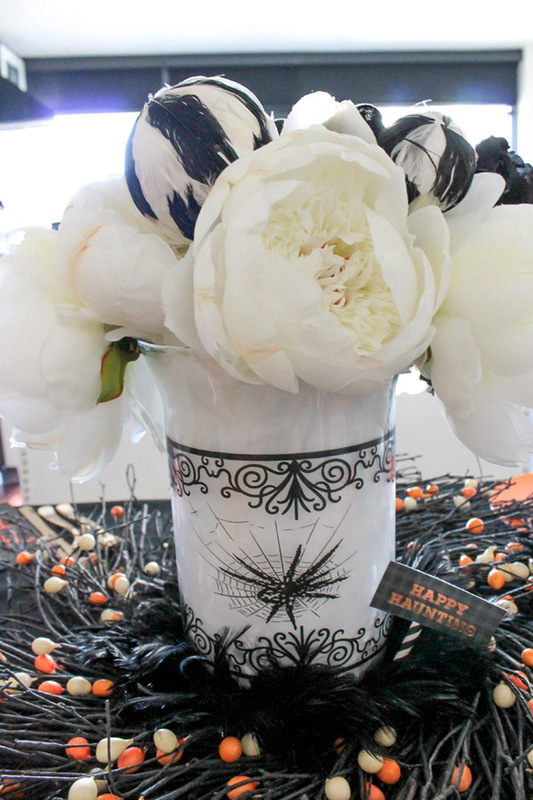 We had this spider vase as part of our Halloween candy bar supplies and it doubles as a fabulous vase! We also love peonies so we included lots of those, some black hydrangea and some spooky filler. 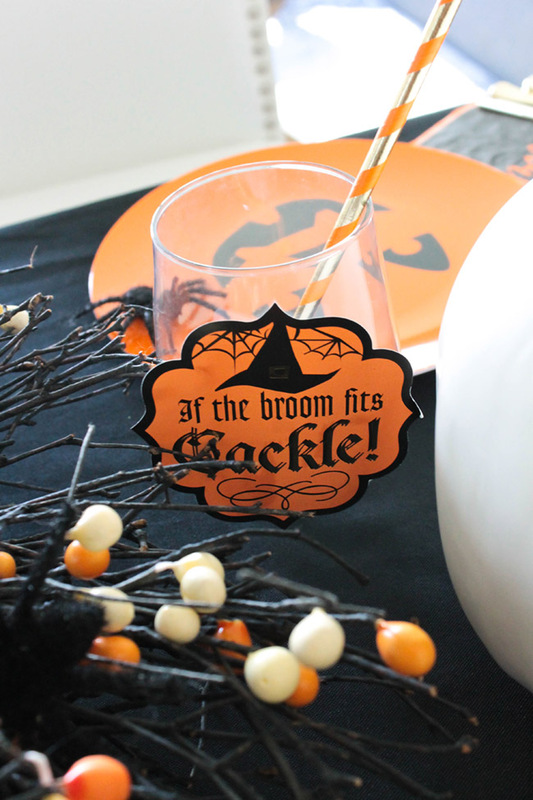 We also grabbed a Halloween wreath that we had to add some more fun details to the Halloween tablescape! Love this EEK pumpkin too! The sparkle and glitter of the other smaller pumpkins on the table were a favorite detail as well! 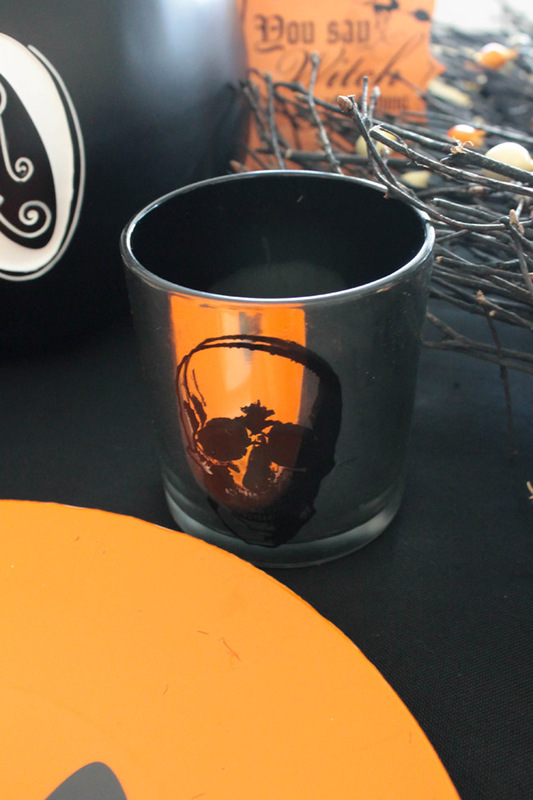 Aren’t these votive candles so spooky!? We love them! Love those trick or treat napkins! 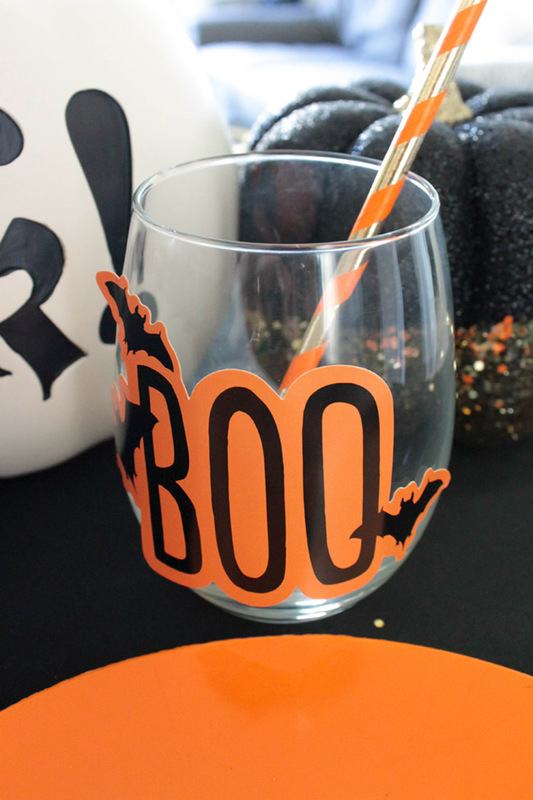 This Halloween sticker totally makes this wine glass. So cute! 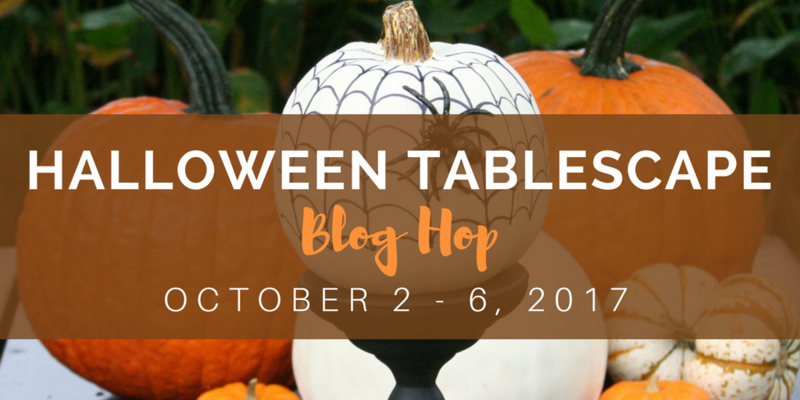 If today was your first stop, be sure to check out all of the fantastic Halloween tablescapes on the blog hop that were on the rest of the week! Thank you so much Kari! Great to see Millers have the creative bug in common! Thank you for sharing your fun halloween table. I love participating in this fun table blog hop! Thanks, Tammy! The blog hop and your table was lovely! So elegant and playful, with bewitching touches everywhere. The votives add a dramatic glow, and your centerpiece is stunning. 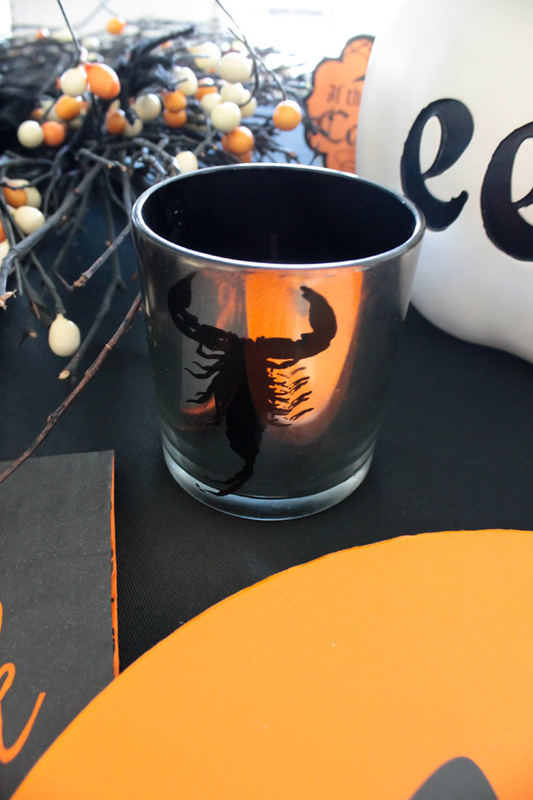 Love the spider vase, the banner, pumpkins, dishes and the peek into your gorgeous kitchen. Loved playing with you! WOW! 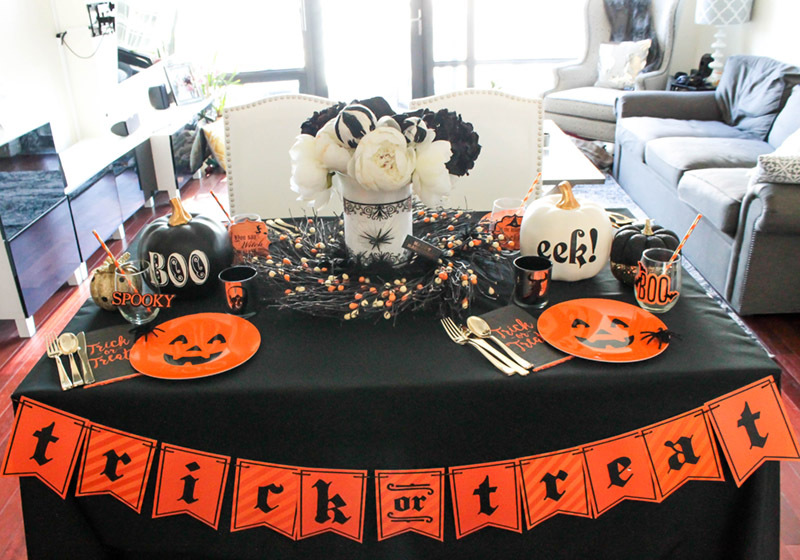 That is a B OOTIFUL and SPOOKTACULAR tablescape. I love it! Thanks Mary! I love the glasses too! What a beautiful table! 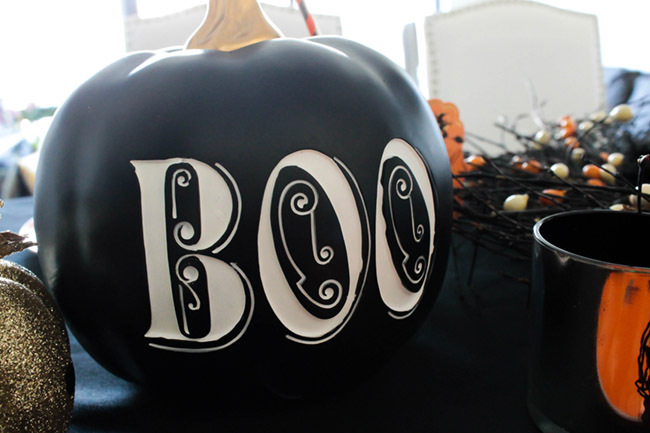 That vase and the “Boo” and “EEK” pumpkins add an elegant touch to your tablescape! I love the black and orange with just a touch of the white. Thank you so much for being a part of another tablescape blog hop, you always do such a great job! Thanks so much for organizing Chole! I loved seeing everyone’s table this week! 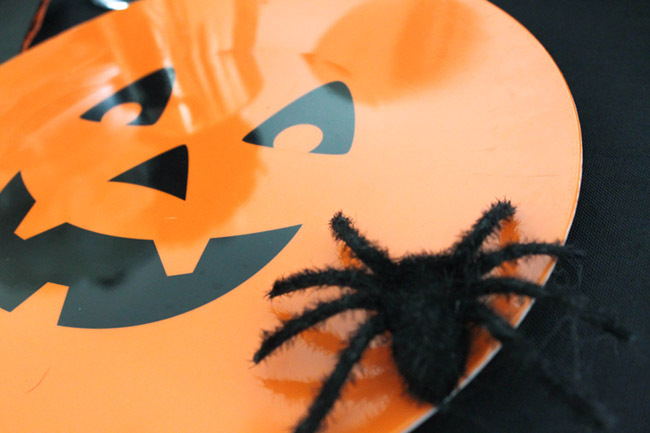 Terrifically spooky Halloween table in a fun way! Love the sayings on the stickers and the wreath at the bottom of the centerpiece looks wonderful. So many great items grouped in a very pleasing way! Beautiful tablescape, love it! 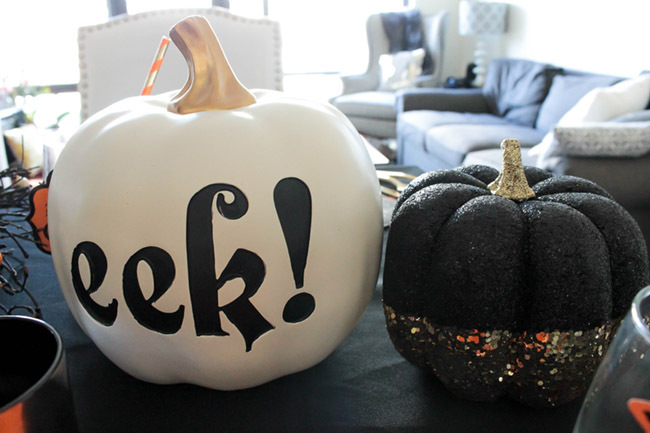 The “Eek!” pumpkin is so fun! 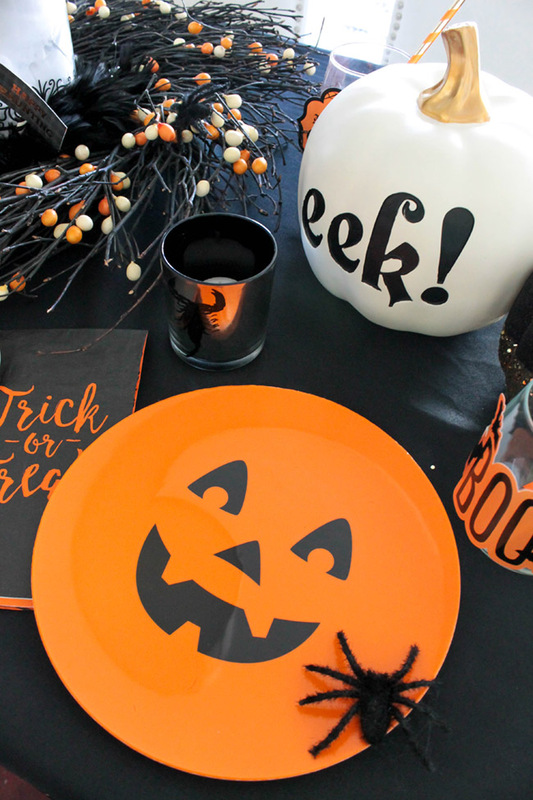 Such a fun Halloween table! It is not only cute but pretty too! It has been so much fun blog hopping with you! Happy fall!!! So so cute!! Love the fat pumpkins with fun fonts! Thanks so much Jenna! The pumpkins are one of my favorites. Hello I found you from the Halloween tablescape hop! 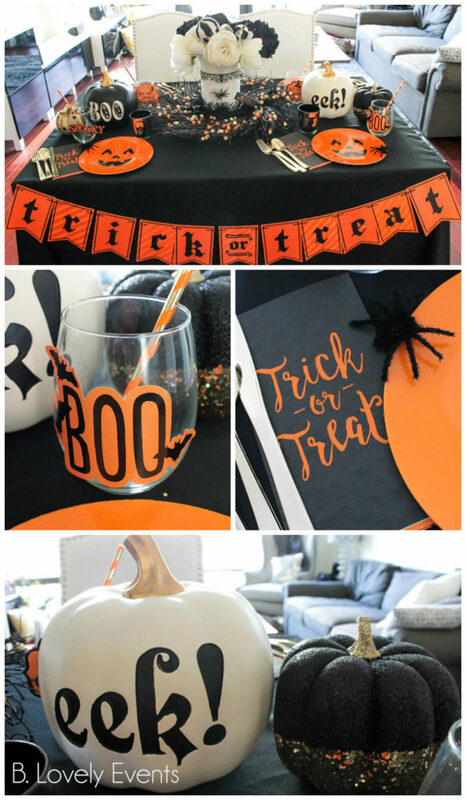 I love your fun Halloween decor and would like to invite you to link up to the Hauntingly Beautiful Decor Halloween Link Party! Your centerpiece arrangement is so fun and interesting and I love all the festive straws! Some of the other ladies on the tour have joined already. You can link up as many times as you like now through Halloween with old or new posts. Hope to see you there!